Added on December 7, 2012 by Sara Distin. Originally published March 21, 2012. It’s strangely appropriate that a little fog has set in over NYC today, obscuring the tops of buildings. It brings us a little closer to the source—psychologically, if not physically—of today’s editions. Taunting from 12,198 feet, the peak of El Teide rewards hikers with views of the Canary Islands stretching out, swimming below, all the way to the coastlines of Europe and Africa. 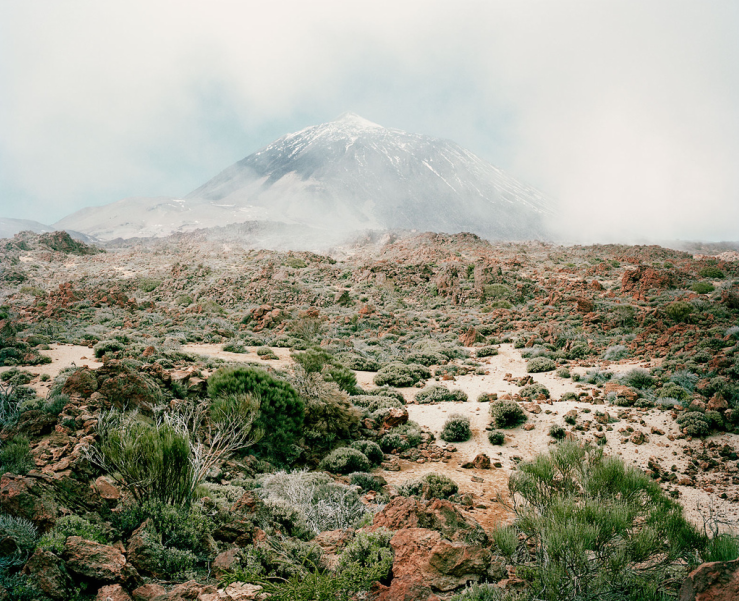 But the German photographer Meike Nixdorf wasn’t tempted by the summit and instead spent her time circling the single peak, setting her tripod and photographing obsessively from dozens of angles, including those in El Teide, view #03 and El Teide, view #06—cryptically, but thoroughly, documenting the peak and its flanks. The 36-year-old German photographer came to New York in 2005 and, like many artists on their first trip to the city, received some of the best and worst of feedback. She relays in an interview with Hey, Hot Shot! that someone told her, “This is very beautiful photography, but pretty much any good photographer could have shot this.” Initially a little shocked, she took the feedback in stride and went back to work, furthering her practice as an artist at the International Center of Photography, and eventually capturing the attention of the panelists at the most recent HHS! review when she submitted In the Orbit of El Teide, which includes El Teide, view #03 and El Teide, view #06. She’s also gone on to have her work acquired by the MoMA in Rio de Janeiro, was chosen as a finalist in the 2011 FotoVisura Grant competition, was recently featured on La Lettre de la Photographie and, currently, as a Hot Shot, has her work on view at Jen Bekman Gallery through this Sunday, March 25th. And how could we not help ourselves from being totally smitten with her photographs? Lush details of exotic foliage burst over dirt and ash, filling every frame. Pinks and blues roll into one another, the layered hues creating entirely otherworldly images, transporting us far away from the landscapes we know intimately and inhabit. How vast or small this particular place might be is a mystery. But, as the peak of El Teide hides and Meike seeks, swirling to the summit, secrets are divulged to everyone who is also willing to look closely. More than making a seductive game out of the multiple perspectives, in In the Orbit of El Teide, Meike ends up finding (and sharing) one distinct point of view—her own.